We need your current contact information, so please get in touch so we know we've found you all. To receive an invitation, please contact Reunions of America - email lireunions@aol.com or call (631) 266-1836 and speak to Liz or Cathy. If you have any questions, you can contact Teresa Ward-Greifenberger at tlgreif@optonline.net or Cyndi Walker-Sessoms at xanaducs@aol.com . Price of reunions, gasoline and airline travel getting you down? with the Class of 1975! playing your favorites from the '70s, '80s and '90s. memories -- and make a few new ones! and our friends and fans from all classes. Reserve by April 22 for $20 price; by May 6 for $25 price. Being that our 40th reunion never formalized, a few of us from the classes of '65 and '64 have decided to meet at Classics Sports Bar for "Happy Hour," any time from 5PM on Friday, May 20th preceding the Alumni Bar Night (which begins in the same location at 9 PM with live entertainment from the Class of 1975). (I probably won't get there until around 7 PM myself). Fund Raising Event at Classics in Levittown - Friday, October 22, 2004 at 8pm, at Classics Sports Bar & Grill, 3271 Hempstead Turnpike, Levittown, NY. A fund-raising event for the 77the Family Readiness Center, an agency that cares for the spouses and children of our troops in Iraq. Specifically our local United States Army Reserve units that are shipping out by the end of October 2004, the 306th Military Police Battalion and 310th Military Battalion in Uniondale, NY, units of the 800th Military Police Brigade in Uniondale, NY, a subordinate command of the U.S. Army 77th Regional Support Command in Fort Totten, NY. Some of these unbelievably brave men and women will be in attendance, so this will be a Good-Luck, Godspeed Party as well as a fundraiser. It will be a festive good time with a Halloween theme. $10 admission will be collected at the door. This and all proceeds from this event will go directly to troops and their family members via holiday parties and gifts, emergency financial assistance, care packages, phone cards, etc. Sponsored by Blacklight and parents and PTA of the Harold D. Fayette Elementary School (Merrick), and countless others. and Geri Iorizzo (Fayette School parent)"
1977's 25-year reunion (outcome not reported) - We are in the process of putting at the very least a picnic together, possibly a cruise for the weekend of August 24, 2002. Class of 1971 is having a picnic at Forest City Park in Wantagh on Saturday, June 29, 2002. Time is 10 am and it's bring your own food. This is in response to many classmates asking for a picnic for those who would be in the area, instead of waiting 5 years. With the loss of one of our classmates on 9/11, Jane Hagan Josiah, there was a need for many to reach out and not wait years to see one another. The committee invites 1971 classmates and all are welcome... spouses, children, grandchildren, significant others, siblings, friends from other classes, parents, teachers... have we left anyone out? Please pass the word! For more information please contact someone on the committee [see end of this page]. The Picnic is coming up quickly... Saturday, June 29th from 10 am... on! Remember to bring your own food, chairs, etc. If it rains, bring umbrellas and ponchos. Bring your spouse, friend, siblings, children, grandchildren, parent, or just yourself! We'll be there from 10:00 for the early birds who want to read the paper with a cup of coffee or tea to start the day. Pass along the information to any classmates you keep in touch with, especially those without computers. We heard from many classmates... we realize that there are other events going on that weekend that prevent you from attending the picnic, however, some friends will be attempting to stop by to say hello and that's is great. Some out-of-town classmates will be in the area and the timing works out for them to attend. We also heard from others who were unable to make the incredible weekend last July and who are happy to have a chance to meet this time. There should be a pretty good turnout! Take Oakfield south over the Southern State overpass and make a left onto Barrie Dr.
Make quick left onto Morgan Drive. App. 3/10th of a mile make a left onto Pond which leads into the park parking lot. Reserved picnic area is on the right just behind the playground. 1964-1965-1966 mini-reunion - Saturday, February 9, 2002. Specifically inviting classes of 1964, 1965, 1966 -- and any and all alumni who would like to stop by! Informal, casual neighborhood bar in Island Park. "Join Ed & Dolores (Lantt) Hofman, the new proprietors, for some good reminiscing of days gone by!! 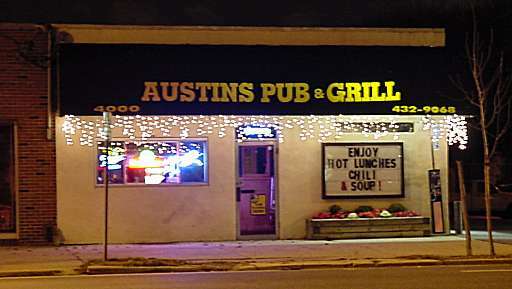 Austin's Pub & Grill is a small local bar with 15 bar stools and 8 tables with 16 chairs. We have darts on Mondays, pool on Wednesdays, Karaoke on Friday nights and weekends vary. A few of us from the classes of '64 & '65 have been meeting for brunch occasionally on LI; it's nice. We thought Austin's would make for a good occasional gathering place between reunions. Pub food is pretty much always available - hamburgers, fries, mozzarella sticks, fried shrimp, poppers, etc. My husband is there pretty much through the day and serves hot, hearty lunches, soups & chili. We don't really serve dinner, just lunches and pub food. It is definitely an over-21 kind of place; depends on what's going on as to what age group is there. Happy hour is 4-7pm on Monday through Friday. The place is approximately 1400 square feet and can accommodate 50 - 70 easily! I didn't book a DJ, but we have an excellent jukebox with a diverse selection." - Dolores (Lantt) Hofman, DAHS class of 1965. Thank you all for your enthusiasm and support for what proves to be a memorable event! "We have had very successful reunion weekends (5, 10, 20 and 25) and we hope to continue them. Please help us find the rest of our classmates. Some have been difficult to track down. Even partial information can be helpful." 20th reunion was held Friday, August 3, 2001 at the Swan Club in Roslyn. We'd love to hear from ALL members of the class of 1981, if possible. E-mail me ( Marlene Munnelly - mm14la@aol.com ) with your current address, phone and e-mail address. We'd like to can count you as "found", and send you information as it becomes available, and list you in the Alumni directory, even if you can't come to the reunion. Here is a reasonably complete class list (the one from our yearbook). The names with [found] we have contacted or reasonably believe we have found (same last name listed at last known address). All the others remain on our "wanted" list. If you can provide any info such as current address, phone number, e-mail, on yourself or others, please write in. If you have any additions (others who moved away, etc. ), please write in.